A rendering of evolv 1, the first recipient of the Zero Carbon Building – Design certification by Canada Green Building Council (CaGBC). Evolv1, a 9290-m2 (100,000-sf) multitenant office building under construction in Waterloo, Ont., has been awarded Zero Carbon Building – Design certification by the Canada Green Building Council (CaGBC). Developed by The Cora Group, evolv1 is one of 16 projects across the country selected by CaGBC to participate in a two-year pilot of its new Zero Carbon Building Standard. designed onsite renewable energy systems capable of providing a minimum of five per cent of building energy consumption. The building, designed and engineered by Stantec and constructed by Melloul Blamey, is also targeting platinum certification under the Leadership in Energy and Environmental Design (LEED) program and will produce more energy than it consumes when complete. “We are proud of how evolv1 expands the definition of sustainability. This project advances the business case and economic model for sustainable design in a multitenant building. It is a building that supports human health and wellness, important characteristics for today’s premiere tenants and their employees,” says Richard Williams, principal with Stantec. a combination of photovoltaics (PVs). 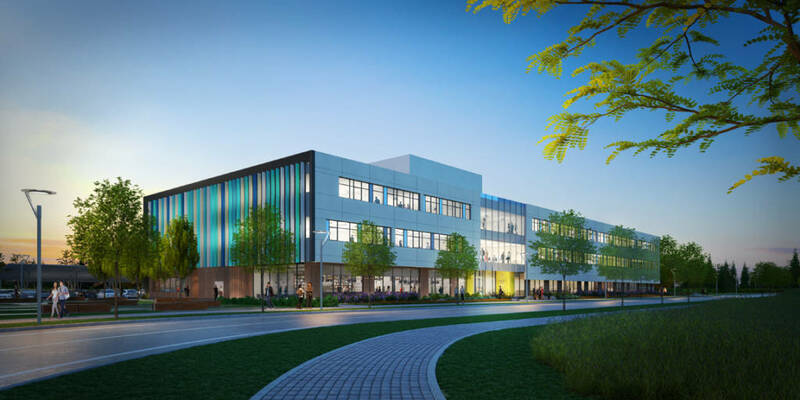 The evolv1 project is a collaboration between The Cora Group, Sustainable Waterloo Region, The David Johnston Research & Technology Park, and anchor tenant E&Y. Set to be completed in summer, evolv1 will also become home to Waterloo’s tech company, TextNow. Over the course of the first 12 months of operation, evolv1 will monitor performance to demonstrate it has achieved a zero emissions balance to earn Zero Carbon Building – Performance certification.